A little over a year ago we started buying small quantities of Quartz crystals with blue needles of Dumortierite inside. The locality, is western Bahia, near Vaca Morta Quarry, a remote and hard to reach area near the border with Tocantins state. The production is not small in terms of material, but most pieces don’t have any inclusions. Around 20 to 30% of the material has the desired blue inclusions. The first pieces I’ve seen, had very fine, almost hair-like inclusions. The same production had also pieces with blue clouds, sometimes phantoms, very similar to Papagoite in Quartz. The price also sky rocketed mid 2014, since the demand was huge and the supply limited. There was another find in the end of 2014. This time with slightly larger pieces, and some of the Dumortierite crystals were thicker with a metallic sheen. A small amount of deep blue pieces was also found. It is very interesting to note the range of colors from colorless to Sapphire-blue to sometimes brown and yellow. 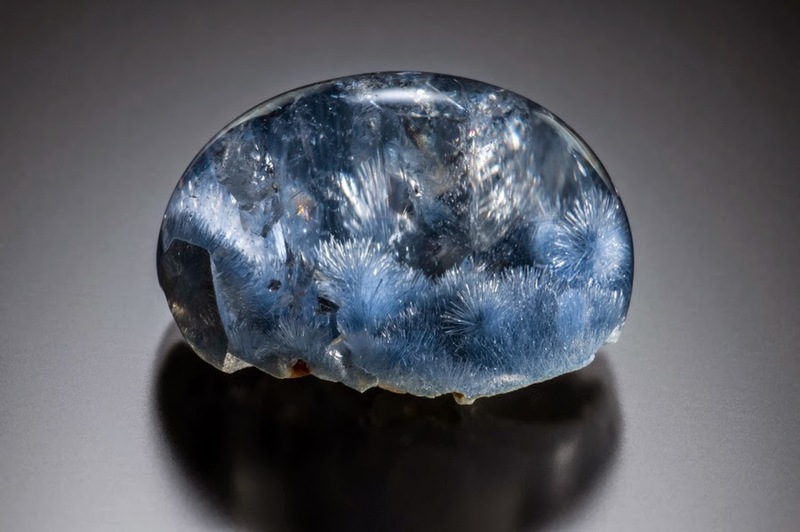 The Dumortierite is usually concentrated on one side of the crystal, usually the bottom. The cabochons are cut leaving the bottom uncut to preserve the inclusions as much as possible. Dumortierites were always common in this part of Bahia, but according to John Koivula, from GIA, this is the first time it is seen as visible crystals inside Quartz. We usually offer uncut crystals, polished points and cabochons. Here, sharp blue needles making a line in the middle of the cabochon. Here, a little cluster with Dumortierite in the smaller crystal. Here, another natural crystal with a "blue carpet" and one terminated Quartz inside. Here, a blue cloud, dotter with white fuzzy spots. Here, a phantom-like pattern with little needles coming out of it. Here, a strange white/yellow phantom mixes with blue needles in the bottom. A cluster with fine needles on one side. 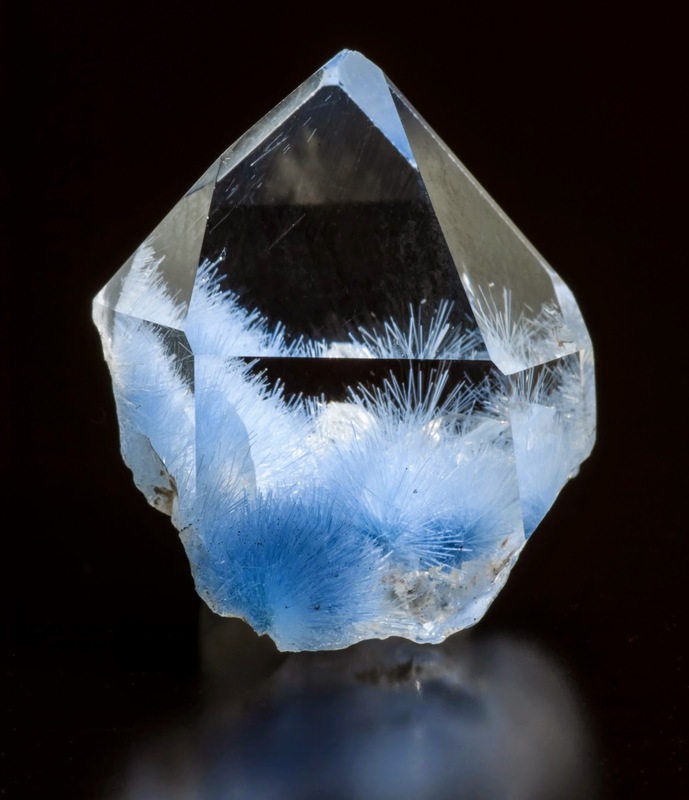 A double terminated crystal with Dumortierite in the bottom and scattered needles near the surface. This one has a blue layer in the bottom and a single Quartz crystal coming out of it. I came across a very interesting material this Springfield. Little dark Almandine crystals embedded in blades of metallic grey Graphite schist. Mined in Erving, Massachusetts, they were interesting just like that, but the way they prepped the material, clearing out the schist out of the back of each individual Garnet, made the beautiful red color pop when backlit. After about 5 years, the material was finally for sale and the debut was in Springfield. Most crystals were under 1 cm in average but I saw a few over that size. The largest piece to come out of the ground, 3 years ago, was 2.7 cm. Prices vary according to the size of the Garnets more than the size of the matrix. And of course the clarity plays a factor in the price too. Gems for sale were around half a carat, well cut, with moderate inclusions. I was told the the largest cut stone was 4.72 carats. 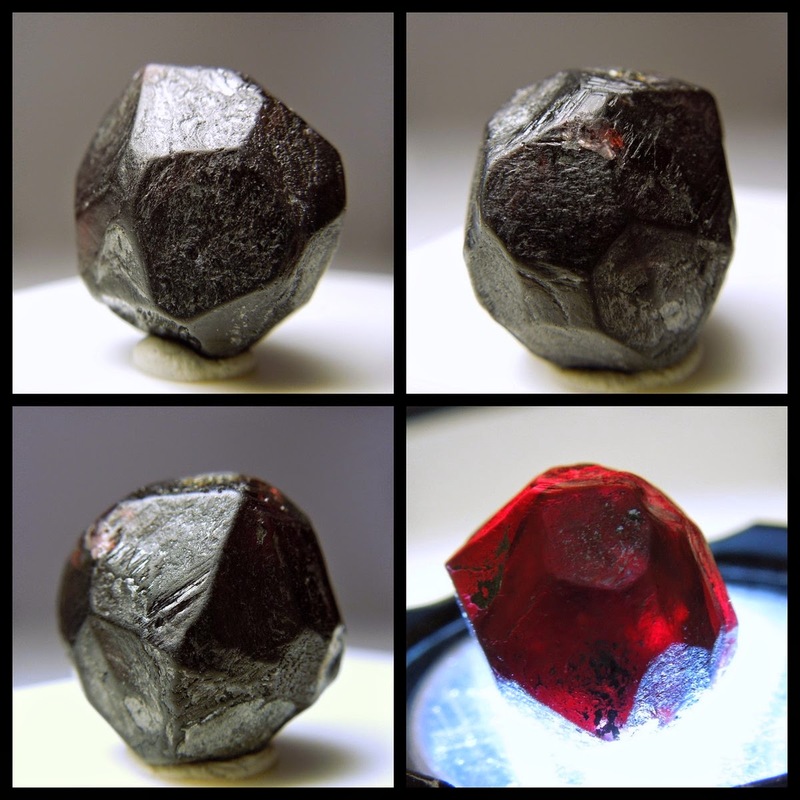 When the Graphite is mined, you can't really see any Garnets. That is why the preparation takes so long. Some pieces have interesting black needles. I've been told first that they were Amphiboles. But later analysis showed them to be Dravite. I had first pick at the show and selected pieces that had good clarity and were aesthetic. I did get some cheaper smaller ones too. So if you would like a piece, please get in touch. left overs in creative ways. 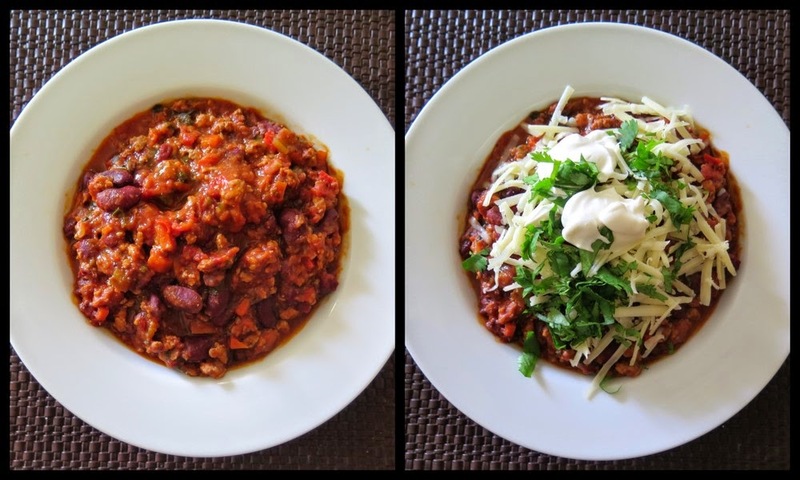 This week I made a delicious Turkey Chili. I had left overs and thought it would make the perfect stuffing for red peppers. I also had a cup of brown rice from the other night. I mixed the turkey chili with the rice and filled a couple red peppers (4 halves). The main trick here, is to microwave the pepper halves (without the stuffing) on high for 3 minutes. Since the pepper takes too long to cook, it will expedite the process. Compact the filling into the peppers, add some shredded cheese and bake for 20-30 minutes until the cheese starts to bubble. Sprinkle with cilantro and serve hot. I served mine with corn bread on the side. This is a fail proof recipe that will sure please everyone that tries it. 1 large can of kidney beans (or 2 small ones). In a large heavy pot, heat the olive oil and saute the turkey, breaking up large chunks. When it is cooked through, transfer to a bowl and add a little more olive oil to the same pot. give it a good stir to blend well. Add the turkey back to the pan and give it another good stir. Add beans, tomatoes, tomato juice and chicken stock and simmer over low heat for 40 minutes. Stir once in a while and if you think it's drying up, add a cup of hot water. Season with salt and pepper to taste and add 1/2 cup of cilantro. Simmer for another minute. 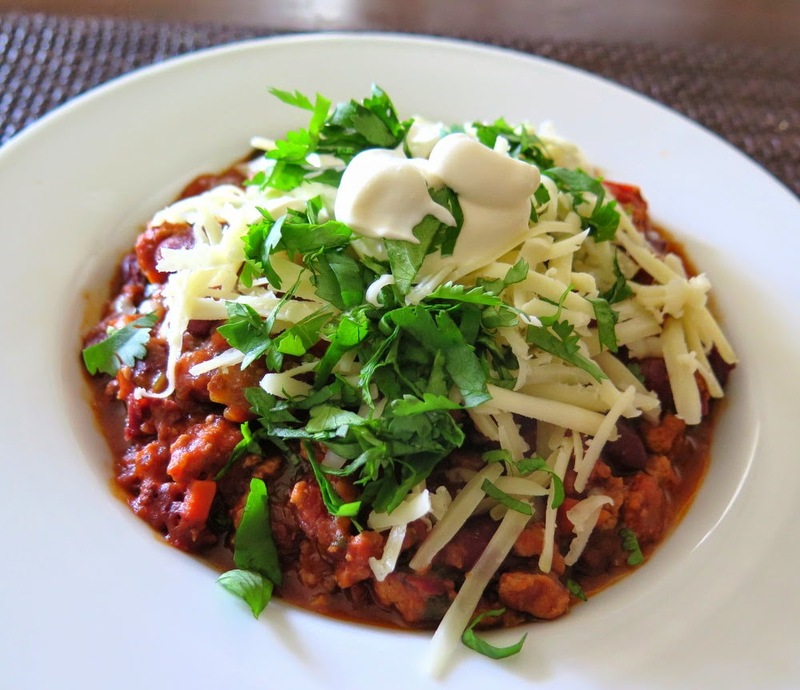 Spoon into soup bowls and garnish with the remaining cilantro, cheddar and sour cream. Tip: before starting to simmer it for 40 minutes, Have a little taste. Sometimes I add a little extra coriander or chili powder. To be very honest, when I hear the word burger, turkey is the last word that comes to mind. What I really like is a nice all beef juicy burger. That said, I also like to experiment with different possibilities and today I made one that was pretty good. The main secret is the sauce and the salad. They will give the taste and moisture that turkey usually lacks. The recipe has three parts, the turkey patty, the sauce and the salad. 2 tbs grainy Dijon mustard. 1 garlic clove, pressed or minced. 1/4 cup grated aged cheddar cheese. Mix all the ingredients with your hands and make patties. It should yield 4 pieces. 1 bunch of black kale, or cavolo nero or any kind of kale you like. 1/2 cup good olive oil. Mix all the ingredients vigorously so the kale is completely covered with the dressing. land your burger on the top of a little salad mountain. Or serve this salad with some grilled shrimp. 2 tbs finely chopped mint. Mix really well and keep it refrigerated until time to serve. Cook the burgers on skillet or grill. Add a spoon of aioli to the bottom of the bread, ( I used brioche buns) the burger, and a spoonful of kale salad on top. You can also add a slice of cheese to the burger just before they are done. I served mine with an exotic mix of chips from Terra. It has carrots, kabocha and purple potatoes. This is a really simple dish that packs lots of flavor and healthy ingredients. spices and cook for a couple minutes. Add the squash, chickpeas, prunes, lemon zest and broth and simmer until the squash is tender. You can add a little water if it starts drying out. Stir in the watercress or spinach and cook for a couple minutes. Check the seasoning and add salt/pepper if needed. Serve over brown rice or couscous. I have heard, not long ago, that the blue Apatites from Ipirá, in Brazil, were radioactive. I know that Apatites can be a little radioactive due to impurities of Th and U, so I decided to investigate a little further, since it is one of my favorite Apatites. they turned out to be radioactive indeed. 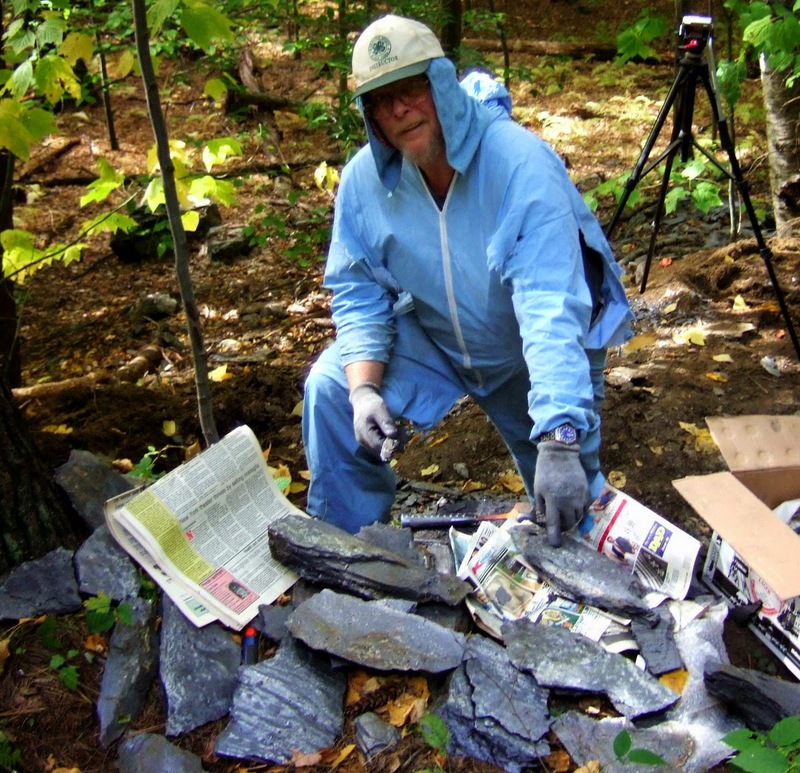 I contacted John Rakovan, a mineralogy professor in Ohio, that has an extensive knowledge about Apatites. And he kindly checked a couple pieces for me. He used a nuclear radiation meter that detects alpha, beta, gamma and X-rays (but does not distinguish among them). At a distance of 1 cm he recorded 0.113 mrem/hour from the Apatite. As a comparison, the background reading in his lab is 0.007 mrem/hour. 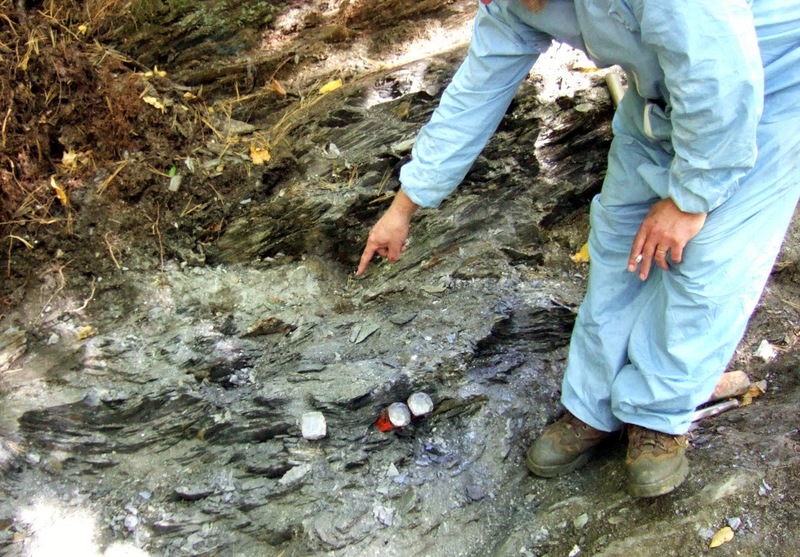 A granite pegmatite sample of the same size from Moat Mountain, New Hampshire is 0.017 mrem/hour and a 1 cm specimen of Autunite gives off 6.624 mrem/hour. "Given the US standards I would say that an average adult occasionally wearing an Ipirá would have no statistical increase in risk of cancer due to the radiation dosage. Even at a doubling of the average background dosage (aprox. 800 mrem/year) by wearing it all day, every day. The dosage is far below the US allowable dosage for radiation workers (5000 mrem/year). Allowable dosages are based on risk probabilities. If one has an understanding of radiation and radiation safety this is just fine, but for someone who does not understand, then there is likely to be fear from hearing that a gemstone is radioactive." Chilean sea bass is one of my favorite white fish. Apart from being sustainable, it is mild with a moist, flaky texture. Cooking "en papillote" is a very easy and fun way to prepare it. You seal the ingredients in little parcels of parchment paper or foil, pop it in the oven and voilà! Dinner is ready! little salt and pepper. I like to put the garlic and onions in the bottom reserving a couple garlic slices. add a splash of white wine and a good olive oil drizzle. Seal everything inside the parcels by folding the edges. They will look like big empanadas. Bake it for 20 minutes and serve immediately.